Take a look at this very rare, wood shafted iron from circa 1760. 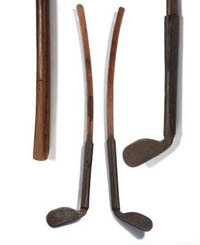 Few clubs of this vintage have survived the ravages of time. Knowledgable collectors often estimate the number of pre-1800 clubs in the world at fewer than 25! Most of these clubs are in museums or private collections and they very rarely become available for purchase. Nearly all of these clubs are of Scottish manufacture with the irons having a very squared-off toe. Yet this club is quite different with a rounded toe and extra long and thick hosel supporting a heavy and sturdy shaft. Rafter Radiocarbon Laboratories in New Zealand carbon dated the wood in the shaft to 1760 with an error factor of +/- 40 years. This would generally be a very good indication of the club’s approximate date of manufacture because wood is dried for only a short period of time (about a year) before the moisture content is lowered enough to be useful as a handle or shaft (if wood is dried too long, the moisture content becomes too low and the wood becomes brittle; a protective coating over the wood at the finish of manufacture seals the wood’s moisture content at the ideal level). Golf was played in the Americas in the 1700s in both South Carolina and New York. Shipping records from the Scottish port of Leith show that a shipment of balls and clubs reached Charleston, South Carolina in the 1740s and there are British military journals and ads from New York newspapers that document play on Long Island, New York later in the 1700s. This particular club with its slightly more crude design than the surviving examples of golf clubs of Scottish manufacture from the 1700s is a very historically significant golf club being perhaps the earliest known example of an American-made golf club in existence! The club itself is 35 1/2″ long and weighs 24 ounces. The heel to toe length of the clubhead is 4 1/2″ and the width of the blade is 3/16″. The hosel is 9″ long with a circumference of 3 1/4″ and is pinned in two positions, one high and one low. The clubhead is a separate piece of metal from the hosel. The club has a lie angle of 62 degrees with 16 degrees of left-handed loft. The shaft tapers from round at the hosel to square at the grip. There is a “V” cut into the grip indicating the correct placement of the right hand above the left on the wood shaft! See the pictures of how this works with the left-handed “baseball-style” grip which was used at the time. Two pre-1800 irons sold at a September 2007 Sotheby’s auction in New York for $151,000 and $181,000 respectively, and both were of the more common Scottish manufacture. Check out our many other fine examples of playable and collectible hickory shaft golf clubs on our eBay store.